A closer look at NSW politics - without a vested interest, an agenda to push or a chip on my shoulder. Sometimes we really need a Premier to be the adult in the room. 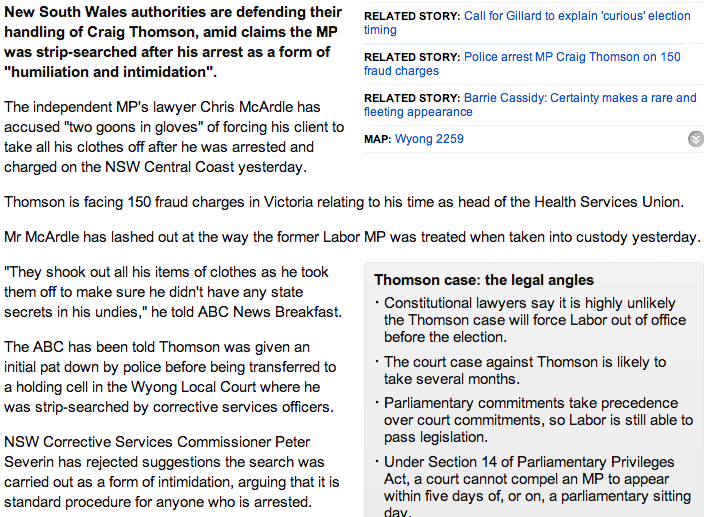 The Craig Thomson debacle was a good opportunity for O'Farrell to show that this was who he is able to be. I'm not going to repeat the background of Thomson - anyone with a pulse in Australia must know who he is and what he is alleged to have done. In any event, his lawyer has been extremely active in the media over the last fortnight, talking about the legal process, the public manner in which he has been arrested, not to mention many of other complaints. It's just unhelpful. O'Farrell needed to either explain why what was done was standard procedure for all persons going into custody, or he needed to explain why Thomson was singled out. That joke was made in full knowledge that it would be the line that the journalists ran, and it's more than just a cheap shot. If Thomson was in fact singled out, then it is a serious matter. If he was not singled out, the Corrective Services deserve to be backed up by their premier. I know it may sound like I'm being a little precious, but I just think that O'Farrell needed to be the one acting like an adult in the face of the frantic arm waving from Thomson's lawyer. Instead, he delivered a cheap joke. And to think that the Libs refuse to make any comment on the Ashby case on the grounds that it's sub-judice.